Two negatives make a positive, right? Today is my youngest sister's 21st birthday. As I was flipping through some old photo albums and trying to find some embarrassing photos of her to post for the occasion, I got to thinking about a particular idiosyncracy in (about?) the way my family celebrates birthdays. Anyway, since the tradition of cutesy cake giving was rather short-lived, I have only a few photos of nasty ice cream concoctions to share. Luckily, the cream of the crop (so to speak) just happened to be for one of Caroline's birthdays (pictured below). 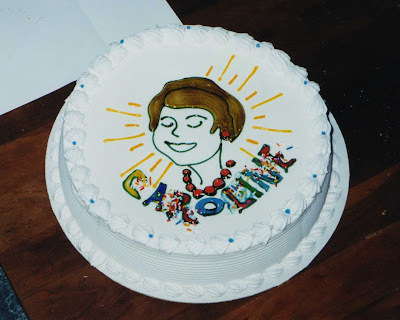 It was originally intended to be a Mother's Day cake, as evidenced by the giant "MOM" scrawled underneath that beaming rendition of a woman resembling Sally Forth (sans black shaggy 80s comic book hair, of course). We got the employee to wipe off the two 'm's and to write Caroline's name on either side of the leftover 'o'. You could (and still can) see the blue smudges from the 'm's underneath, so the employee covered it with sprinkles to disguise the botched icing name job. Sweet. I like Depeche Mode. A lot. All text is copyright 2006-2008 by the author. Thank you for giving credit where credit is due!